I had reservations with Rachel Hauck’s other novels because my reaction to her first novel, Lost in Nashvegas was just lukewarm. I liked it, but it didn’t amaze me or blow me away and I haven’t picked it up again since I read it the last time. I read Sweet Caroline with low expectations, just so I won’t be disappointed with this buy. I’m kind of glad that I didn’t have much expectations, because I was really pleasantly surprised by this novel. Sweet Caroline is quite…well, sweet, for the lack of better words. Everything in this novel is just sweet and charming, from Caroline to the Frogmore Cafe staff to the other secondary characters to the town itself. This is one of the few times I really appreciated the setting of a novel, and it’s in a Southern town again. I love the quirkiness of the town, the Frogmore Cafe and everyone else in the story, as it provided me with a very warm feeling, almost like I was one of the Beaufort residents. It was almost like the book was welcoming me into its arms, inviting me to join them in their different town adventures. 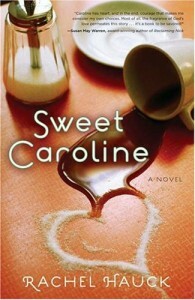 Caroline is definitely a character, one I’d love to be friends with myself. In a way, I think a lot of women in their 20’s could relate to her, because I definitely did. She’s far from perfect, and most of the times, she had no idea where to go or what to do. But when extraordinary opportunities come knocking, she felt overwhelmed, and she didn’t know what to do. Don’t we all have that same reaction? Despite her confusion, Caroline chose the smaller thing over the big thing, and she proved to be faithful with that. My favorite part of the novel is when the staff were preparing for Hurricane Howard, and Caroline planned to feed the people of Beaufort for free, knowing that there wouldn’t be enough power to cook their meals in the next day. Caroline’s generosity is something to emulate, and I think she wouldn’t hesitate to give her staff a personalized grilling toolset if they really, really need it. Heart: For once, I agree with you. Head: What do you think he’s up to? And, we’ve agreed before. Heart: Do we risk it? Head: No. Stay in neutral, heart. Heart: But he’s changed. Really. I practically swooned when I read that part! :) Heeee. But if you think it will end up the way it seemed from that part…well, there were still more surprises down the end, and those made the novel stand apart from others. It’s not really just a love story between two people. It’s a love story between a woman and her God, and a story of how a woman found herself through the love of Someone who loves her more.